We all have heard the horror stories about the 6.0 Powerstroke trucks and lots of folks are a little bit nervous of it’s big brother, the 6.4 Powerstroke. But is the Ford 6.4 Powerstroke diesel really that bad? The engine is in the same boat as the 6.0 version in that once some things are dealt with, it is a pretty solid performer. We will go through a few things to look for when buying one, or if you already own one some tips for taking care of it. One thing we see a lot is leaking radiators. They have plastic end tanks that are held on by the aluminum center section tabs that crimp the end tank in place. The crimps spread apart from either pressure or twisting of the vehicle’s frame and the radiator will leak. Unfortunately there is no fixing it when this happens. The whole radiator needs replaced. The newer replacement radiators seem to hold up better though. It appears they have made the crimped tabs stronger. If you are buying 6.4 Superduty, check the frame area beside the radiator for signs of coolant leaks. The next problem is the one that puts these trucks in the shop the most. The egr and dpf system is a nightmare. The Exhaust Gas Recirculation (EGR) system consists of two egr coolers and an egr valve. Exhaust gas enters the lower horizontal egr cooler from the driver’s side exhaust manifold. It then passes through the vertical egr cooler which is visible when you open the hood. It is the long rectangular part that is at sort of an angle on the front of the engine. The upper cooler is connected to the egr valve that will introduce the hot exhaust gas into the intake manifold. The Diesel Particulate Filter (DPF) system is the large round unit located underneath the truck towards the front of the exhaust system. The DPF is the back part of that unit behind the row of bolts that connects it to the catalytic convertor in the front. The EGR and DPF systems work together to help the engine meet emission standards. Here is how: If you look, there are several sensors located along the exhaust system. They read the exhaust gas temperature before, in, and after the DPF filter. There is also a pressure sensor mounted on the dpf to measure exhaust back pressure there. The DPF filter itself collects soot from the engine’s exhaust. When the sensors determine that the DPF has become a certain amount clogged, it requires the system to do a regen. You may have noticed the cleaning exhaust filter message displayed on your dash gauge area when this happens. During a regen, the egr valve is opened to let hot exhaust air into the engine to raise exhaust gas temperatures. This gets the DPF extremely hot. Then the fuel injectors fire a mist of fuel when the piston is on the exhaust stroke to introduce fuel into the exhaust system. The extreme exhaust gas temperatures and the raw fuel in the dpf will cause all the soot to burn out and cleans the filter. Once the computer feels the dpf is clean enough, it ends the regen. You will probably notice a loss in power and fuel economy when this happens. Some trucks will also smoke out the tail pipe during this process as well. There are a couple of major problems with this emissions system. First, it is extremely restrictive. Not only does it cause poor fuel economy when the truck is regen, but fuel economy in general is terrible. The second problem is since fuel is being fired into the cylinders during the exhaust stroke, fuel wash down and oil dilution happens. It is not uncommon for trucks with a functioning egr/dpf system to gain a gallon of oil or more between oil changes. This extra oil is fuel. Unfortunately, fuel does not do a good job lubricating the bearings and hard parts of the engine. If you are going to leave the dpf system intact, it is extremely important to change the oil every 5,000 miles. Ford recommends 10,000, but the oil gets so diluted at that interval that engine damage can occur. A common question is if the egr and dpf system can be removed to make the truck reliable like the 6.0’s. The answer is yes. Of course we would never recommend tampering with any federal emission devices on a vehicle that is registered for highway use. That would of course be against the law. However, if you were in a country with no emissions, use your vehicle strictly for off road use, or are using your 6.4 Powerstroke for a competition use like sled pulling or drag racing only, there are products available to remove both systems. The EGR Delete with intake elbow will let you remove both egr cooler and the egr valve. There are DPF/CAT delete pipes that bolt directly in place of the convertor and filter as well as complete exhaust systems from MBRP, Diamond Eye, AFE, and Flo Pro. If you install either product by itself, the truck will throw check engine codes and may enter a no start fault. A programmer must be installed at the same time that removes the dpf and egr programming from the vehicles ecm. Not only will they allow for the complete removal of the egr /dpf and all related sensors, but they will also add up to 300 more horsepower. It could be assumed that fuel economy and mileage would go up, but as we mentioned earlier, it is illegal to remove emission devices from legally registered vehicles in the US. We already talked about fuel dilution from the dpf regen cycles, but there is also another good reason to keep a close eye on your oil level. The 6.4 Powerstroke engine is a common rail type fuel system. What that means is that there is a central injection pump that pressures the fuel up to 24,000 psi and delivers it to a rail on each head. Every injector has a single fuel line from the rail to feed it this high pressure fuel. The injector and these fuel rails are located under the valve cover. If any fuel leak occurs in this system, it will leak directly into the engine oil. Keeping an eye on the fuel level can help you catch this potentially fatal engine problem before engine damage occurs. As long as we are talking about the fuel system, there is one other quick item that most owners and techs overlook. 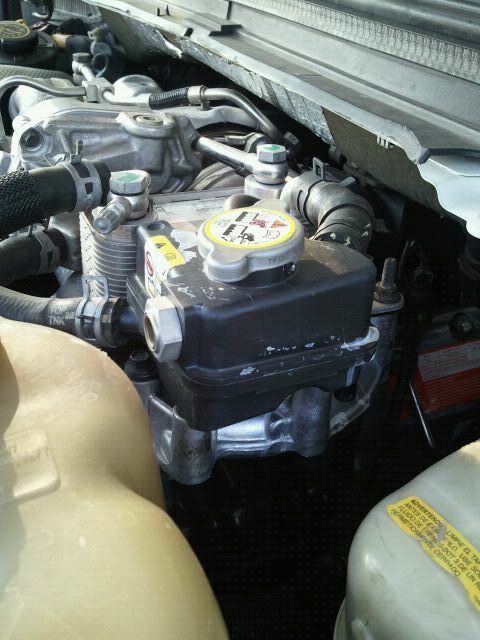 To the left of the engine coolant reservoir is a small black tank with a radiator style cap on it. This is a coolant system that cools the fuel. It has regular antifreeze coolant in it. In a complete lapse of common sense, Ford put a sight glass on the all black reservoir which renders the sight glass useless. Just take the cap off and make sure it stays full. If it goes empty it will either burn the coolant pump for the system out or worse damage the expensive high pressure fuel pump. There is a lot of internet chatter about the twin turbo system on these trucks but we see very few problems from them. If the egr system is removed we almost never see a problem. Two things to be aware of though. First, the bolts that hold the two turbo chargers together often fall out. At least half of the 6.4 Powerstroke twin turbo trucks that come in the shop are missing these bolts. Odds are nothing is going to happen but it does open the door for things to wiggle apart and cause problems. The second issue are the expansion joints in the pipes from the exhaust manifolds to the turbos. They will crack and cause a severe lack of power and usually a terrible hiss type sound from the engine compartment as boost comes up. If you are buying a truck look for soot on the firewall or hood area as evidence of an exhaust up-pipe leak. Another area of potential problems is the front cover. It can develop leaks in the water pump area that lets coolant leak into the crank case. There is more common on the F450 and F550 trucks because they have really lower gears that cause the engine to turn higher rpms on average. While it can happen on a F250 or F350, it is not nearly as common. It is yet another reason to keep a close eye on your engine oil for the level raising. Another issue that commonly gets misdiagnosed is the oil cooler getting blocked off by debris in the coolant system. The 6.4 shares this issue with the 6.0 Powerstroke equipped trucks. The egr system breaks down the coolant due to the extreme temperatures the exhaust gasses place on the coolers. The silicates drop out of the coolant causing a sludge that makes a mess of the coolant system. This sludge material plugs heater cores and commonly the oil cooler. If the delta between the coolant temperature and the oil temperature gets too high a wrench light will appear on the dash and power will be derated. This is really hard for a tech to diagnose because it usually only happens when the truck has been towing for a couple of hours when the problem starts. The wrench light will come on and the power will be cut. After it cools down and the engine is turned off and back on, everything will be back to normal. This is why a coolant filter is suggested for these engines if you are leaving the egr coolers intact. As for regular maintenance, the oil and filter should be changed every 5,000 miles religiously if the dpf system is still in place. The interval can be extended to 10,000 miles if the dpf is removed and synthetic oil is used. Also, always use the factory style cartridge filter and factory cap. The use of the Napa/Wix taller cap and filter is not recommended. The fuel filters should be changed every 10,000 miles and the water separator drain should be opened once a month. It is also a good idea to check your oil and coolant levels once every other week to make sure everything is ok. While this seems like a long list of things that could go wrong, we see fairly few issues with these engines. They are a big improvement over the 6.0 they replaced. They have great, smooth power, very quiet noise levels, and start incredibly well in the cold. 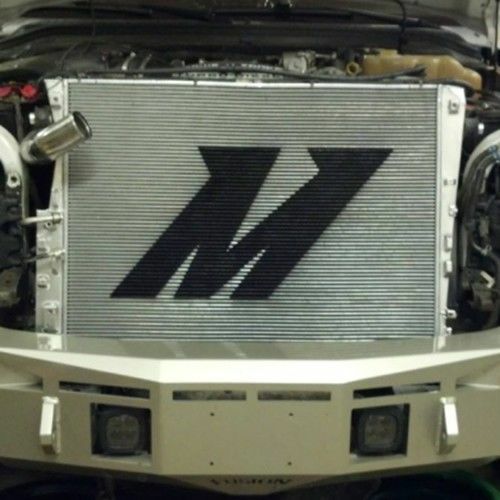 Head gaskets are not an issue as unless the truck is run hard pushing extreme horsepower levels. Fuel mileage is usually pretty poor but some aftermarket magic can usually cure that. For example, one of the trucks we tow our big show trailer with is a 2008 F350 6.4 Powerstroke pushing close to 600 horsepower at the wheels. The fifth wheel show trailer weighs roughly 15,000 pounds and we average about 14 miles per gallon towing it. (we don’t go slow either) The 6.4 Powerstroke diesel is perhaps one of the best diesel engines to ever put in the Ford F-Series trucks. Simple modifications and good maintenance keep these trucks running good for a long time.